Monroe County is a county located in the U.S. state of West Virginia. As of the 2010 census, the population was 13,502. Its county seat is Union. Monroe County was created from Greenbrier County in 1799. It was named for James Monroe who eventually became the fifth President of the United States. Monroe County was the home of Andrew Summers Rowan of Spanish-American War fame, who is immortalized in Elbert Hubbard's classic A Message to Garcia. The county was also the site of the 1928 discovery of the 34.48 carat (6.896 g) Jones Diamond by Grover C. Jones and his son, William "Punch" Jones. Monroe County celebrates its own holiday, Farmer's Day, and is known for its close community. According to the U.S. Census Bureau, the county has a total area of 474 square miles (1,227 km²), of which 473 square miles (1,226 km²) is land and 0 square miles (1 km²) (0.06%) is water. Monroe County was formed on January 14, 1799 from portions of Greenbrier County. It was named after James Monroe, a Virginia statesman and senator, and the future fifth President of the United States. Farmer's Day is held every year on the first Saturday in June in Union. Held in honor of the countless farming families in the surrounding area, the event is stretched out over the entire weekend, including the Friday evening dance held in the local grocery store's parking lot, the Pancake Breakfast and Farmer's Day Parade on Saturday, and the numerous shows, games, and activities that take place well into Sunday evening. Fresh food produced by the citizens of Monroe County, is sold along the sidewalks, games for children can be found in the various parking lots, and live music by one of the local bands is played throughout the weekend. Popular events include the annual horse show, car show, and fire works. As of the census of 2000, there were 14,583 people, 5,447 households, and 3,883 families residing in the county. The population density was 31 people per square mile (12/km²). There were 7,267 housing units at an average density of 15 per square mile (6/km²). The racial makeup of the county was 92.67% White, 5.98% Black or African American, 0.23% Native American, 0.16% Asian, 0.01% Pacific Islander, 0.03% from other races, and 0.92% from two or more races. 0.49% of the population were Hispanic or Latino of any race. There were 5,447 households out of which 29.00% had children under the age of 18 living with them, 59.80% were married couples living together, 7.90% had a female householder with no husband present, and 28.70% were non-families. 25.80% of all households were made up of individuals and 13.10% had someone living alone who was 65 years of age or older. The average household size was 2.41 and the average family size was 2.88. In the county, the population was spread out with 20.10% under the age of 18, 8.10% from 18 to 24, 30.30% from 25 to 44, 26.10% from 45 to 64, and 15.40% who were 65 years of age or older. The median age was 40 years. For every 100 females there were 79.70 males. For every 100 females age 18 and over, there were 73.80 males. The median income for a household in the county was $27,575, and the median income for a family was $35,299. Males had a median income of $25,643 versus $22,104 for females. The per capita income for the county was $17,435. About 12.60% of families and 16.20% of the population were below the poverty line, including 21.30% of those under age 18 and 12.30% of those age 65 or over. 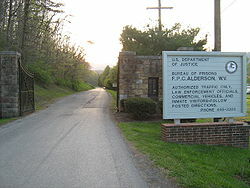 The Federal Bureau of Prisons' Federal Prison Camp, Alderson was the first women's federal prison in the country. It is located in Monroe and Summers counties just west of Alderson. One of Monroe County's geological features is Haynes Cave, a former saltpeter mine. Strange bones were discovered by the miners at the end of the 18th Century, and mailed to Thomas Jefferson. Jefferson's study of the animal, the Megalonyx jeffersonii was arguably the birth of American paleontology. It is now the official West Virginia state fossil. ^ Keller, Julia. "It's a gosh-darned good thing: Stewart heads to West Virginia." Chicago Tribune. October 1, 2004. Tempo 1. Retrieved on January 5, 2010. ^ "Martha's Prison Thanksgiving." The Cincinnati Post. November 24, 2004. Retrieved on January 5, 2010. "Mullins said the prison dormitories are in Summers County." ^ "FPC Alderson Contact Information." Federal Bureau of Prisons. Retrieved on January 5, 2010. ^ Steelhammer, Rick (2008), "W.Va.'s 'Official' Sloth Fossil on Display near Cheat Lake", Charleston Gazette, Thursday, Sept 19, 2008. This page uses content from the English language Wikipedia. The original content was at Monroe County, West Virginia. The list of authors can be seen in the page history. As with this Familypedia wiki, the content of Wikipedia is available under the Creative Commons License.